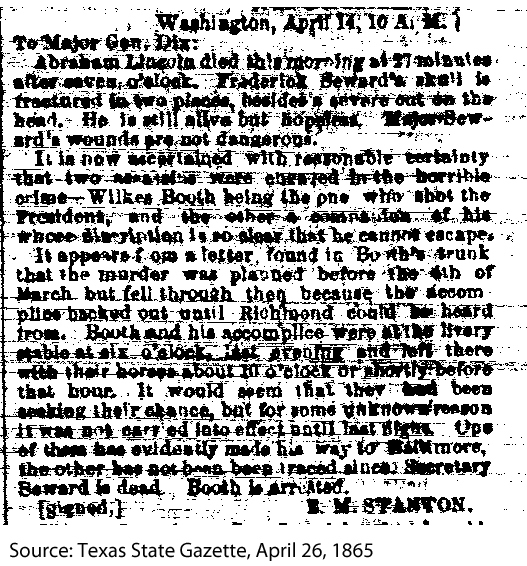 Published in the Texas State Gazette on April 26, 1865, Secretary of War Edwin Stanton sent this short account to Major General Dix chronicling the events of the assassination and naming John Wilkes Booth as the shooter. 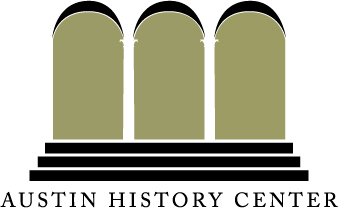 Washington, April 14, 10 a.m.
Abraham Lincoln died this morning at 27 minutes after seven o'clock. Frederick Seward's skull is fractured in two places, besides a severe cut on the head. He is still alive but hopeless. Major Seward's wounds are not dangerous. It is now ascertained with reasonable certainty that two suspects were engaged in the horrible crime-Wilkes Booth being the one who shot the President, and the other a [?] of his whose description is so clear that he cannot escape. It appears from a letter found in Booth's trunk that the murder was planned before the 4th of March but fell through then because the accomplice backed out until Richmond could be heard from. Booth and his accomplice were at the livery stable before six o'clock last evening and left there with their horses about 10 o'clock or shortly before that hour. It would seem that they had been seeking their chance, but for some unknown reason it was not carried into effect until last night. One of them has evidently made his way to Baltimore, the other has not been traced since. Secretary Seward is dead. Booth is arrested.